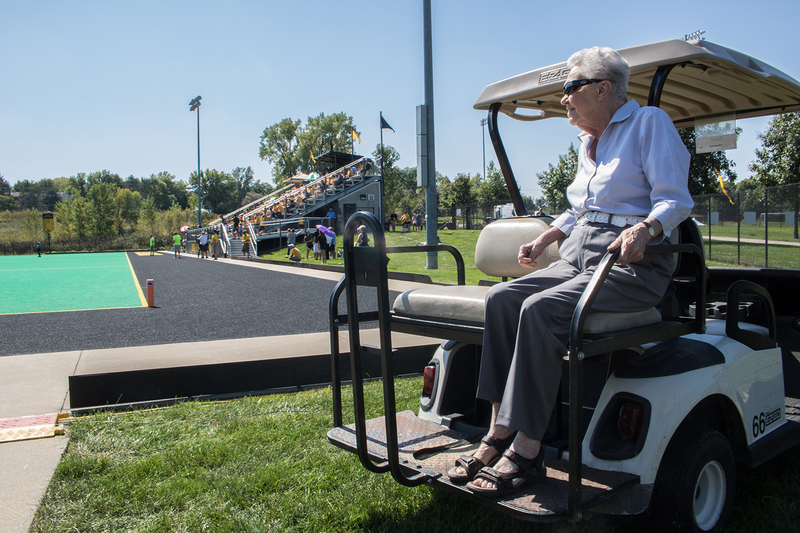 Grant Field namesake Christine Grant watches the Iowa field hockey team in action against Indiana on Sunday, Sept. 16, 2018. Christine Grant, a teacher, leader, and legend, looks back on her life of friendships made and history written. Picture Carver-Hawkeye on Feb. 3, 1985. The Hawkeye women’s basketball team will face Ohio State. Christine Grant, then the Iowa Women’s Athletics Director, showed up around 9 a.m. to prepare for the afternoon game. When she arrived, fans were already lining up. A third of a century later, Grant, in her 80s, recalled the moment from her living room in Coralville. Weeks before the game, officials decided that they would try to break the attendance record at a women’s basketball game, Grant said. It was hard to get people excited for women’s sports back then, and she noted that it’s still fairly difficult now. She knows well how hard it was for women in intercollegiate athletics and academics. 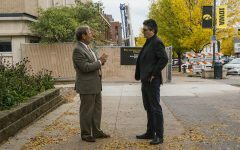 Grant is a legend on the UI campus and beyond. She has devoted her entire life to the field of gender equity at the intercollegiate level and ensuring that women have the access to academics and athletics guaranteed them by Title IX — a federal law that states no person in the U.S. will be denied participation in or benefits of any education program or activity, and no one can be the subject of discrimination. Grant was the UI director of Intercollegiate Athletics for Women for 27 years. During that time, the program had 12 NCAA championship sports that won a combined 27 Big Ten titles. She is a member of the Hawkeye Athletics Hall of Fame and has garnered numerous accolades for her contributions to the sports world. But in 1985, then 48-year-old Grant was just trying to drum up support for a group of women who she felt deserved recognition in a world in which they were often ignored. She enlisted the help of then-Men’s Athletics Director Bump Elliott, one of Grant’s favorite people in the world, men’s basketball coach George Raveling, and wrestling coach Dan Gable to spread the word. Football coach Hayden Fry even asked how he could help. They all did TV commercials to promote the game. Carver reached its 15,450-person capacity hours before the game started. Cars were backed up to I-80, and Grant frantically got on the radio, urging people to turn around. Arena staff closed the doors but didn’t lock them. Crowds came into Carver in what Grant called an orderly fashion. Everyone wanted to be part of a history-making game. The game, which Iowa lost, 56-47, to Ohio State, broke the NCAA record for attendance at a women’s intercollegiate basketball game, with 22,157 people clamoring to get in what was from then on known as, “The Game.” The university sent Grant a letter of reprimand for the thousands of excess people after being contacted by the fire marshal, which she framed and hung in her office. While talking about the game, Grant began laughing, lifting a hand to her mouth to stifle some lingering giggles. She seemed incredulous that the Hawkeyes actually broke the record, even after all this time, and that she got disciplined for it, though she said she deserved it. Christine Grant poses for a portrait in her home on Friday, Sept. 14, 2018. Grant, now retired was the first woman to be Athletic Director at the University of Iowa and was involved in the formation of the national Title IX policy. “Imagine getting a letter of reprimand for having too many people at a women’s game,” she said. In addition to serving as the first UI women’s athletics director, Grant also taught in the Graduate College. Her teaching career lasted for 50 years, both in Scotland and at the UI as an associate professor in the Physical Education Department until 2006, the year she was also inducted to the Iowa Athletics Hall of Fame. After all these years, she still keeps in touch with many of the students she taught. Amy Wilson, the NCAA director of inclusion for gender equity and LGBTQ+ issues and whom Grant dubs her last graduate student, said she chose the UI over other schools for the opportunity to learn from the woman who helped create Title IX. “I thought, ‘If I’m going to go get a Ph.D., that would be the best person in the world I could ever learn from,’ ” Wilson said. She said Grant was dedicated to her students, teaching Wilson about Title IX, gender equity, and developing her own philosophy and belief system to stick through everything. Grant was always prepared and made every minute count, even helping Wilson with internships and eventually working with her on Title IX research. 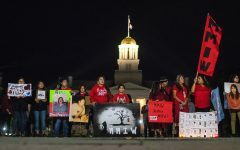 Before Grant retired from the UI, Wilson said, she kept track of national Title IX data, such as participation in Title IX policies and how much money was spent on it. Grant then asked Wilson to continue her work. Wilson still turns to Grant for advice, guidance, and a keen eye for edits. She said Grant likes to tease her about how the student is now the one giving out homework. The best gift anyone could give to Grant, who doesn’t like the spotlight, Wilson said, is to continue her work. 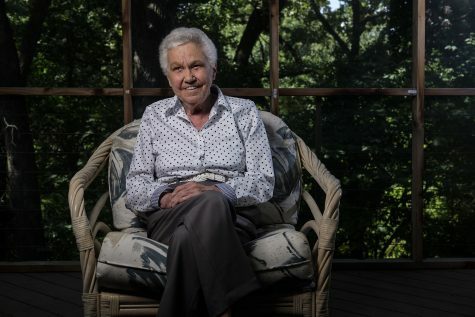 “If you’re going to call people pioneers or trailblazers, that’s the core category that Christine Grant and others who worked with her [are in] … they’ve been working and fighting their entire lives so that … girls and women across the world can have opportunities,” Wilson said. Women’s basketball head coach Lisa Bluder learned about Grant in college and first met her when Grant gave a lecture about gender equity at Drake University, the school where Bluder coached at the time. Now the coach with the most victories in the program’s history, Bluder remembers seeing a knowledgeable, strong woman who carried herself with confidence. The two women only had a few months to work together once Bluder joined the UI, but she spoke proudly of that time and what Grant did for intercollegiate athletics. When talking about Title IX and gender equity at the university level, Grant’s passion became a physical presence in the room. Title IX came into effect in 1972 while Grant was studying, requiring universities to offer equal opportunities to both genders in academics and athletics. By 1978, all universities were supposed to be in full compliance, but Grant said that date passed with very few schools changing their ways. Willard “Sandy” Boyd, the UI president from 1969 to 1981, said he first met Grant when he was the chairman of the UI Human Rights Committee. The panel looked into discrimination issues on campus, such as in admissions and athletics, and Grant had a hand in making the university more inclusive. “Christine is more than a leader in terms of athletics, important as that has been, but she was a leader in the feminist movement, opening the university to women,” Boyd said. He praised Grant and those who worked with her for the huge strides they made in gender equity nationally, and he said Grant has a way of drawing people in and making them listen. 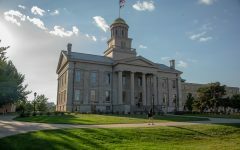 The UI recently had to prove its compliance with Title IX to the federal Office of Civil Rights after a lengthy investigation into alleged gender discrimination in athletics. In 2015, Jane Meyer, a former UI associate athletics director from 2001 to 2014, sued the UI, the state Board of Regents, and the state alleging gender and sexual-orientation discrimination. Meyer stated in the lawsuit she was terminated because she was a gay woman who spoke out about gender discrimination in the workplace. Meyer won the verdict in May 2017 and was awarded $1.43 million. While no direct violations were found in the investigation, the university still has to provide data in some areas to prove there is no gender discrimination. Grant expressed anger and sadness at this and at the university that she put her life into for so long. Grant’s one regret goes back to that time when Title IX first became law. Before beginning her mission toward gender equity in athletics, Grant started her career in sports as a young girl in Bo’ness, Scotland. Her parents made her a deal: If she could keep up with her academics, she could play sports. When Grant was 10 or 11, she began playing netball, which was the No. 1 sport in the world at the time. She described it as six-player basketball without the dribbling or backboards. She played through high school, then fell in love with field hockey. 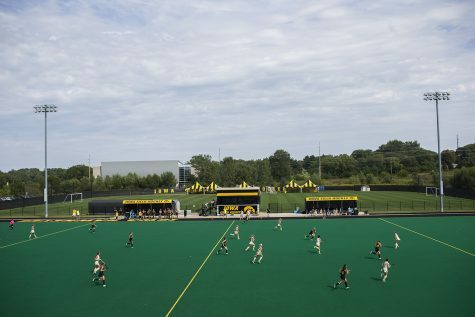 Iowa takes the ball up the field during a field hockey game at Grant Field on Saturday, Aug. 26, 2017. The field is named after Christine Grant, who dedicated her life to advocating for gender equality in college sports. Field hockey became her sport of choice, and it brought her to Canada in the spring of 1961 after college. Before her time there was over, she helped change the face of Canadian field hockey forever. When she arrived, there were only pockets of field hockey spread across Canada with nothing connecting them. Realizing this, Grant and a group of field-hockey fanatics decided to create a national tournament with a team from each province. She also helped establish the first national field-hockey team for women and the Canadian Field Hockey Association. Grant smiled, remembering her involvement in the sport she loves so much. She still goes to every home Hawkeye field-hockey game at Grant Field, named after her. When she first learned this in 1991, she thought they were joking. “Normally, you’ve got to be dead before they name something after you, so I got a shock,” she said. Her friends first recommended the UI to Grant when she was looking to get a master’s degree, she said. They told her the UI had a good reputation, so she decided to check it out, and the warm welcome she received made her stay. “It was one of the few places that didn’t let me flounder around as a foreign student,” she said. Before coming to the U.S., Grant said, she thought all girls had the same athletics and academic opportunities that she did. She went to college in Scotland before coming to the UI in the summer of 1968 to study physical education in the Graduate College. She received a master’s degree in physical education from the UI in 1970, started teaching in the graduate program in 1971, and became the women’s athletics director in 1973. Grant still has family and friends from Scotland and Canada who visit her in Coralville and people who check up on her consistently. 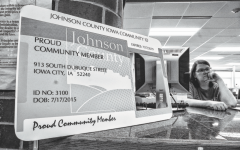 She said Iowans are considerate and helpful, and the city has everything she could want. Iowa City community members have shown their appreciation for Grant in many different ways. In addition to the field-hockey field, Grant Elementary, located in North Liberty, will open in the fall of 2019. She said she felt great surprise when Bluder told her she would be the eponym of a new Iowa City elementary school.